Captain John Baptiste Ford, the father of American Plate Glass, played an important part in Downriver history and proved that imagination and creativity are ageless. For Captain John Baptiste Ford and his sons, Edward and Emory, Downriver was a place where dreams in the dark of midnight became the reality of plants along the Detroit River in Wyandotte, Michigan, a cement plant in Alpena, Michigan, a glass plant in Rossford, Ohio, and a plate glass company on the banks of the Allegheny River near Pittsburgh. The Ford’s businesses sometimes traveled far afield from Downriver, but their foundation remained near the Detroit River in Wyandotte. In his The City of Detroit Michigan, 1701-1922, Clarence Burton traced the beginning of serious industry in the Down River District. He wrote that up into 1888, industry along the Detroit River front from Fort Wayne to Wyandotte and from the other side of Wyandotte to Trenton consisted only of a sawmill at Ecorse and one at Wyandotte. The rest of the riverfront scenery consisted of fifteen miles of marsh and a few fishermen’s shanties. Muskrat and ducks watched the seasonal fishermen angling for sturgeon and the great ships passing back and forth between the Upper and Lower lakes carrying freight and passengers. Then in 1864, Eber Brock Ward and his investors established the Eureka Iron Works on the banks of the Detroit River in Wyandotte and the sound of hammers overpowered the quacking of ducks and the chirruping of crickets. Eureka Iron Works prospered for several years, but in the 1880s the iron market took a downturn and the sources of fuel for the factory almost disappeared. The Iron Works crew drilled, searching for new sources of fuel. They didn’t strike oil of gas, but they did find that Wyandotte rested on the beds of rock salt that extended between Trenton all the way along the Detroit and Saint Clair Rivers to Alpena and into Goderich Canada. When Eureka Iron Works closed in 1892, Captain John Baptiste Ford, a pioneer industrialist working for Eureka Iron Works, recognized the potential of the newly discovered salt beds and worked to develop them because salt was one of the necessary ingredients needed to manufacture soda ash used to make plate glass. In 1889, the United States relied mostly on Belgium and England for soda ash and Captain Ford wanted to end that dependency. He and his colleagues conducted a series of borings along the Detroit River in Wyandotte. They carefully analyzed the salt in the water from the Detroit River and of the limestone deposits a few miles away. Convinced that Wyandotte was the ideal place to manufacture soda ash, Captain Ford and his investors began work on a soda ash manufacturing plant which eventually became plant number one of the Michigan Alkali Company, with John Baptiste Ford as president. In the early 1890s, the Michigan Alkali Company manufactured a variety of chemicals, became prosperous and provided the foundation for the immense chemical plants at Wyandotte and Ford City, which was named after John Baptiste Ford in 1902. According to Polk’s 1907-1908 Wyandotte Directory, the village of Ford or Ford City was an area “immediately north of Wyandotte and extends northerly along the Detroit River to Ecorse Village,” with an estimated population of 1,660 people. The City of Wyandotte annexed Ford in 1922. In the 1940s the company changed its name to the Wyandotte Chemicals Company and it still operates under the name of BASF. John Baptiste Ford learned self reliance early in his life. Born on November 17, 1811 in a log cabin in Danville, Kentucky, he was just two years old when his father. Jonathan Ford, joined the Kentucky Volunteer Homespun Regiment to fight the British at New Orleans in 1813. Jonathan Ford never came home and John Baptistes’ mother Margaret Baptiste, daughter of Jean Baptiste an immigrant from France who fought in the American Revolutionary War, had to raise her family alone. When John Baptiste turned twelve, his mother apprenticed him to a Danville saddle maker, but he ran away from the stern saddle maker at age 14 and settled in Greenville, Indiana. He stayed in Greenville, Indiana, for the next 30 years. Mary Bower, a farm girl from Greenville taught him to read and write and he married her in 1831. The newly married couple opened a small dry goods store and then a shop where they sold saddles and later they started a flour mill. During the Mexican War of 1846-1848, John Baptiste Ford won a large government contract to supply the United States Cavalry. His vision of traveling the Ohio and Mississippi Rivers to open up the vast country west of the Mississippi River motivated John Baptiste Ford to build a boat company at New Albany, Indiana. His shipbuilding activities earned him the name Captain Ford. The 1860 Federal Census showed Captain John Ford, 53, living in New Albany, Indiana, with his 57 year old wife Mary and sons Emory, 17, and son Edward, 14. The breaking out of the Civil War in 1861 provided Captain Ford with the opportunity to supply Union troops with the products that he made in his iron business. In June 1864, Captain Ford and Mary’s son Emory graduated from Duff’s Mercantile College in Pittsburgh. Emory toured some of the many glass works in Pittsburgh with his father, inspiring Captain Ford to open a glass firm back in New Albany. The captain and his son expanded into plate glass operations, something that had happened only in Europe to this point. The 1870 census documented that John Baptiste Ford, age 58, still lived in New Albany, Indiana, with his 62 year old wife and son Edward, 24, and grandson John B. Ford, age 3. According to his obituary in the New York Times, Captain John Baptiste Ford lost everything when he was 70 years old, but he didn’t despair or retire into a poverty stricken old age. In 1874 he started the Louisville Plate Glass Works. In 1883, he and his sons Edward and Emory opened a new company in booming “Pittsburgh, the Gate way to the West,” using money that he had made from some glass patents. The company became the Pittsburgh Plate Glass Company. (PPG) He became known as the father of American plate glass and the town of Ford City, Pennsylvania, was named for him. Even though he had a thriving company in Pittsburgh, Captain John Baptiste Ford continued to develop new businesses in Michigan. He founded Michigan Alkali Company, incorporated in 1894, with offices on Biddle Avenue. The J.B. Ford Company was incorporated in 1898, with Emory L. Ford as vice president and a capital of $100,000. By 1897, the Fords had sold their shares in the Pittsburgh Plate Glass Company and established a new factory near Toledo, Ohio, that they called the Ford Glass Company. It later became known as the Libbey Owens Ford Glass Company. The 1900 census shows widower John Baptiste Ford living in Duquesne, Pennsylvania, with his elderly aunt. He died at his home in Tarentum, Pennsylvania on May 1, 1903. In a May 2, 1903 story, the Detroit Free Press reported his death and noted, “Wyandotte owes its prosperity in great part to his industries.” The story said that he possessed millions, but spent much of his money in religious and benevolent work. He is buried in Allegheny Cemetery in Pittsburgh. Polks Wyandotte Directory of 1907 shows that John B. Ford’s grandson John Baptiste Ford founded the Wyandotte Portland Cement Company, located on Biddle Avenue at the foot of Grove Street in Wyandotte. 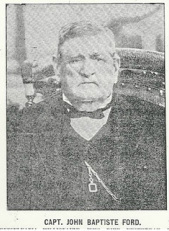 J.B. Ford was vice president, S.T. Crapo, president and treasurer and H.J. Paxton, secretary and general manager. The Wyandotte Portland Cement Company was built on the low lands bordering the Detroit River. High grade materials were used throughout the construction and the buildings were made of steel with brick sides. They had clear spans, with the trestles being carried on brick pilasters. Since water and quicksand were discovered at two feet, the walls were built on brick arches transferring the entire weight to concrete piers extending to solid ground. The plant buildings covered a relatively small area when compared with its total capacity, making it one of the most complete operating plants. The stock house has a capacity of 40,000 barrels, and all of the buildings covered an area of only 25,000 square feet. The plant averaged about 450 barrels of cement a day. During 1900 and 1901, the city of Detroit used Wyandotte Portland cement exclusively for all of its public work. Portland Cement was named because its color resembled the stone from the Isle of Portland in the British Isles. A booklet about Michigan Alkali Company and the Wyandotte Portland Cement Company dated 1898, detailed some of the public buildings that Wyandotte Portland cement helped make possible. The city of Detroit used 3,500 barrels of Wyandotte Portland cement to build mosaic floors and artificial stone walks for the Wayne County Courthouse. The Detroit Water Works building contained 4,000 barrels of Wyandotte Portland Cement in its engine foundations. The Toledo Terminal Railway Company used 10,000 barrels of Wyandotte Portland Cement to build its bridge across the Maumee River at Maumee, Ohio. The engineers after carefully testing imported and American cement brands chose Wyandotte Portland Cement. The 1910 census showed 43 year old John Baptiste Ford, the grandson of Jean Baptiste Ford, living in Detroit with his 30 year old wife Helen S. Ford and their two sons John Baptiste Ford, Jr., 13, and Fred, 11. The 1910 census also shows Emory L. Ford, the 34 year old grandson of John Baptiste living at 1730 Jefferson Avenue in Detroit. He was a widower with a three year old son, Emory M. Ford. Jean Baptiste Ford’s sons and grandsons inherited and further developed the businesses they had started together. Like Wyandotte, Alpena, Michigan had the geographic good fortune to be located in the middle of immense limestone deposits. John Baptise Ford’s grandson John Baptiste Ford and his son Emery L. Ford founded the Portland Cement Company at Detroit in 1907, but they chose Alpena as the site for its plant because of the limestone quarries. John B. Ford served as first president to the company and cement production began at the plant in 1908. Skilled management and workmen quickly shaped the Huron Portland Cement Company into the world’s largest cement plant. The company also had its own fleet of ships that delivered cement to all of the Great Lakes region. John Baptiste Ford presided as president of Huron Portland Cement Company from 1907-1939. Although it has changed names several times, the company still operates under the name of Lafarge North America. Born in Greenville, Indiana on January 21, 1843, Edward Ford spent his adult life working closely with his father in entrepreneurial endeavors and continuing with them after his father died. In 1898, Edward Ford bought 173 acres of farmland on the Maumee River outside of Toledo, Ohio, for his plate glass factory. In August of 1898, the Edward Ford Plate Glass Company broke ground. Edward Ford imported trainloads of workers from the glass plants that he and his father and brother had established in Pennsylvania to help make the Ford family’s latest business a success. Soon a company town grew up around the Edward Ford Plate Glass Factory. Edward combined the name of his second wife Caroline Jane Ross with his family name to christen his company town Rossford. As well as housing for his workers, Edward Ford built the Ford Club near the plant for his glass company employees to socialize with fellow workers and their families. Besides building a new industry along the Maumee River and providing jobs for people, Edward Ford found other ways to express his altruism. People would often see him walking into grocery stories, drug stores, and meat markets in Rossford, but they weren’t sure about his purpose for visiting the stores. They didn’t learn under after his death in 1920 that he had been quietly paying off the long standing accounts of many of his employees. Although John Baptiste Ford and his sons did business in an era when many industries and capitalists built their empires on a foundation of exploited workers. John Baptiste Ford served as a role model of resourcefulness, persistence, and perseverance. He believed in his business ideas, he fought to implement his ideas against great odds, and he didn’t let his age hamper him from achieving his goals. Despite the great wealth he finally managed to accumulate, he didn’t isolate himself from the people that helped make it possible. In the truest sense of “giving back”, he made many contributions to the communities where he lived and to the people that worked for him. Without Captain John Baptiste Ford and his sons Emory and Edward, Downriver wouldn’t have developed into a humming industrial hub of southeastern Michigan. Aiken, William Earl. The Roots Grow Deep: The Story of Captain Ford. Cleveland: The Lezius-Hiles Company, 1957. Pound, Arthur. Salt of the Earth: The Story of Captain J.B. Ford and Michigan Alkali Company. Boston: Atlantic Monthly Company, 1940.